Invest in this flagship equity fund of Axis Mutual Fund to enjoy wealth creation along with tax-saving. Axis Long Term Equity Fund is an Equity Linked Savings Scheme or tax-saving mutual fund with an impressive performance record since its inception. As the deadline to furnish the investment details to claim the tax deduction for the FY 18 is approaching, this fund can be one of the best options to avail the same. The fund was launched in Dec 2009, which spared it from facing the market downfall of 2008. Despite its short existence in the mutual fund space, the fund has the largest AUM of over Rs. 16,000 Cr in the ELSS category which shows the investors trust in its consistent performance. This flagship equity fund of the Axis Mutual Fund is managed by Jinesh Gopani. The undeviating returns of the fund for the prior consecutive years speak of his 16 years of efficient and seasoned management. His focus on business scalability and sector outlook (for 3-5 years) has given 1.31 times of turnover for the past year. Being a tax-saving fund, it not only caters the investors with the tax deduction benefits under Section 80C of the Income Tax Act of India, 1961, but also harnesses its mandatory 3-year lock-in period to the fullest. According to the fund manager, the fund has a unique long-term orientation that besides helping the investor gives appreciable time-space to the team for efficient fund management. The lock-in period devises a unique strategy that generates wealth for the investors in long-term and helps the fund manager to ignore short-term volatility of the market. Let us see how an investment horizon aligned with the market cycle affected Rs. 10,000 monthly investments through SIP over a long time period. On the other hand, let us compare what would have been the difference in the returns if you would have invested Rs. 10,000 in lumpsum at distinctive points in time. The fund management style of Jinesh Gopani suggests his conservative outlook and goal-oriented vision towards all of his schemes. With Axis LT Equity Fund, he has derived some key points which have actually assisted him in designing a risk effective and investment opportunistic portfolio. Regular Research: Following the bottom-up approach, the fund picks the stocks by carrying out regular researches across market cycles (over 3-5 years). Out of the avg. market capital of over Rs. 65,000 Cr, 64% is exposed to the large-cap companies, while 34% to the mid-caps, and the rest to the small-caps. Not sticking to the benchmark, this fund exhibits the characteristics of a multi-cap fund. Quality Picks: Selection of stocks is based on their potential across the economic cycles, long-term sustainable growth, and quality management. The fund has been investing in the ‘Domestic Sector’ of the retail consumption such as private sector banks, housing & consumption, auto, and auto ancillary sectors, where it can leverage the Indian consumer opportunities. Priority to Fundamentals: While being agnostic of the benchmark, the fund manager prefers to invest in companies that evaluate satisfactorily on the qualitative factors. Industry-specific trends, regulations, macroeconomic environment, and several other similar factors influence the stock choice of the fund. For the same reason, the portfolio has a precise yet quality allocation in the Pharma, and Engineering sectors at the bottom. High Conviction Investing: The fund manager believes in keeping it compact. The portfolio reflects a conviction-based investment style that focuses on the companies with sound business models, pricing power, and consistent performance across the economic cycles. Risk Management: With an embedded risk management feature in its investment process, the fund has avoided investing in the businesses with excessive uncertainty on account of cyclic, regulatory, and political risks. This fund has a highly conservative approach towards risk management; hence the risk-reward ratio is very high. 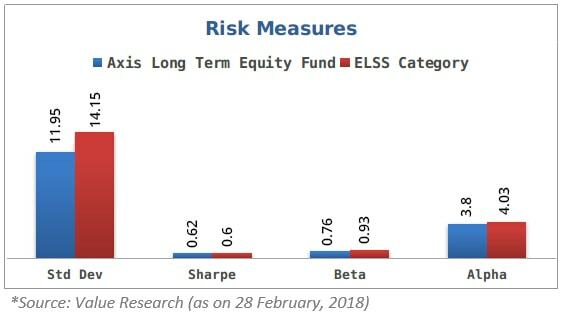 The percentage measures of the risk factors of the fund clearly demonstrate why the fund has outperformed its peers in the category since day one. 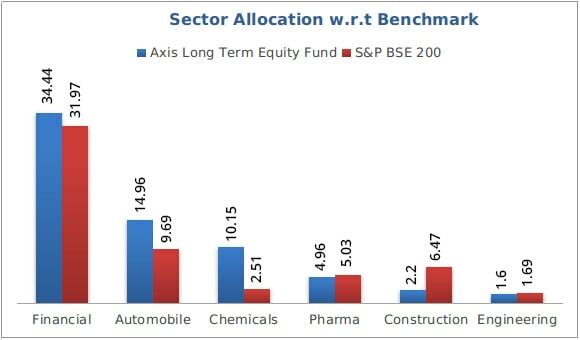 All thanks to the fund manager who has tactically and patiently over-weighted his allocation in the growth sectors. 6.Active Management: The fund is being actively taken care of by the fund manager and his team. This has been reflected in the allocation chart with the best possible investments at all times. Being an equity-oriented scheme, this fund invests primarily in large-cap companies to accrue the benefits in an overvalued market. The three-year lock-in period and the value-oriented stock selection process are actually favorable for the investors. Axis Long Term Equity Fund scheme can be a profitable option for the ones who are looking to create wealth in the long term along with tax-saving advantage. MySIPonline is a unique platform that provides comprehensive information about the mutual funds and the related concerns. Connect with us to invest smartly in this or any of such schemes.